Saturday, Nov. 3 | 9:00 a.m.–12:00 p.m. 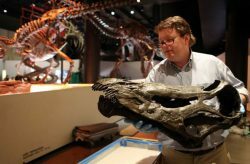 Treat your aspiring Paleontologist to breakfast, lecture and Paleo activities with the Museum’s very own Associate Curator of Paleontology, David Temple, and his very special guest, world renowned paleontologist Dr. Robert Bakker. After enjoying a full breakfast on the Morian Overlook with a stunning view of the dinosaurs below, Dr. Bakker will give an educational talk and David Temple will host several educational and entertaining Paleo activities. Adults must accompany children. Children under 1 admitted free. For tickets, please call (713) 639-4629.